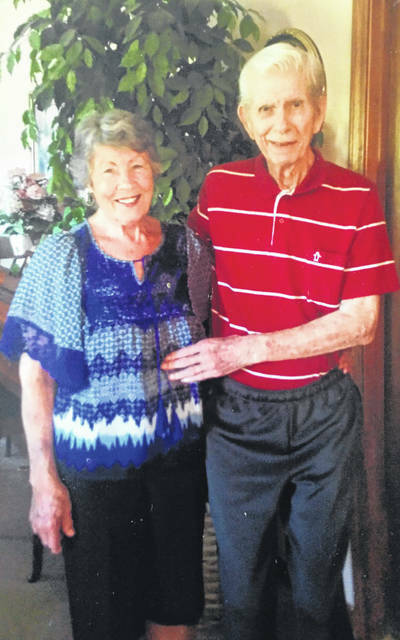 Mr. and Mrs. Roy Jarvis, of Cheshire, celebrated their 66th wedding anniversary on June 14. They were married on June 14, 1952 in Gallipolis. They have two children, Ronnie (Suzi) Jarvis, of Cheshire, and the late Debbie Coup. Grandchildren are Debra (Josh) King of Polk City, Fla., and Jason (Andrea) Jarvis, of Lancaster. Great-grandchildren are Emma, Ethan and Aubrey King of Polk City, Fla., and Holden and Hudson Jarvis of Lancaster. Roy is a retired truck driver and Clarice is a homemaker. https://www.mydailytribune.com/wp-content/uploads/sites/42/2018/07/web1_07271814562.jpgMr. and Mrs. Roy Jarvis, of Cheshire, celebrated their 66th wedding anniversary on June 14. They were married on June 14, 1952 in Gallipolis. They have two children, Ronnie (Suzi) Jarvis, of Cheshire, and the late Debbie Coup. Grandchildren are Debra (Josh) King of Polk City, Fla., and Jason (Andrea) Jarvis, of Lancaster. Great-grandchildren are Emma, Ethan and Aubrey King of Polk City, Fla., and Holden and Hudson Jarvis of Lancaster. Roy is a retired truck driver and Clarice is a homemaker.